It's not meant to be a rhetorical question. I mean it. Are you busy squeezing every experience and opportunity you can into your life or, is life just what happens to you as if you bought a ticket for a train ride and you are watching the landscape roll by out the window? I lost much of my own family early in life and so I'd like to believe that I am the former, that I consciously choose to pack my day in the moment and miss as little as possible. But no matter how much I try I'm certain I leave a lot on the table, so to speak. I learned from those losses- that if I focus on now and not the past, that I have an opportunity to be present and not miss things going on around me by looking over my shoulder. But, and you knew there was one coming, I am humbled everyday by my friend and his family and the way in which they live. You see, he was diagnosed several years ago with esophageal cancer, believed to be highly deadly in only a matter of months normally. But they are anything but normal. They get up everyday fighting for another day. There is virtually no logic to his still being here other than sheer will, and determination, and boat loads of grit. And though he is the one with cancer, they are a team, a team unlike any pro championship winning team I have ever seen. They are lock step in facing and fighting for his daily life. And they have journaled at Caring Bridge, and communicated the entire battle for loved ones and their own sanity, as if those communications outward pull in more fuel and determination for them to be able to fight on. Courage doesn't begin to describe their attitudes. touching, and teaching, and love filled essays compelling all who love them to walk with them. Some times he write, sometimes he does. It doesn't matter because a part of the secret formula for success is they speak as one. As much as they must surely be cathartic on some level to publish and release, their writings are so deeply personal and intimate that you can't help but feel privileged to be reading them, being bathed in the gratitude my friends feel everyday for one more day. And all the while, they have young children who are growing up inside this master class on living life to the fullest. Far from sheltering those kids, they specifically and very intentionally include their kids in everything, but in the way they feel the lids can best digest and be empowered by events and emotions. I truly believe it is that that gratitude and living in the moment as purely as I have ever witnessed, that sustains them. It isn't that their future isn't dark, it is simply that they see only now, this moment, this skirmish, this battle, today. 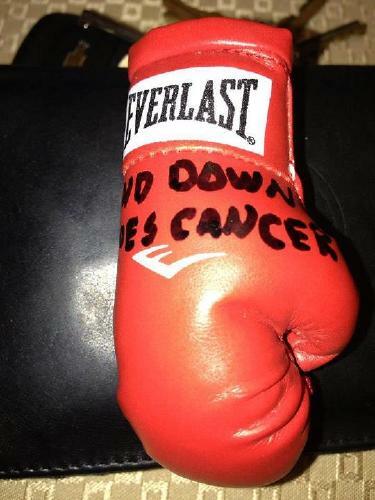 It is no surprise that they adopted the phrase, "And Down Goes Cancer" as their battle cry. They are truly the best example I have ever seen of what is coined, a life well lived. We are all going to die and I am still somehow afraid of that on some level. But their lessons to us all inspire me and beckon me to live now and now and now knowing there will always be circumstances hurled at us. Life will never stop flinging them at us. But the grace, dignity, and endless guts they muster every day in the face if some pretty horrible circumstances and pain, did I mention his horrific pain? move me and elevate me. And isn't that our real challenge in life, to leave a mark that while you were here you left something in the world to make it a better place? Yes, everyday my friends LIVE THAT and teach that. Today, and, tomorrow and tomorrow I hope. I am so deeply grateful to them for my lessons in gratitude, and love, and living right now.